Montana Snowbowl is one of the better kept skiing secrets in Montana. Located just a short hop from downtown Missoula. Montana Snowbowl is a fun ski area that is affordable, receives plentiful snowfall, and has a wide variety of expert terrain. In short, it is a great place to go skiing, especially for those who enjoy tree skiing or are expert skiers. And compared to larger ski resorts, lift tickets at Snowbowl are quite affordable, too. Montana Snowbowl has a solid, and true, vertical of 2600 feet, which is one of the higher lift-served verticals in Montana. The ski area itself covers 950 acres, 500 of which is designated glade skiing. Snowbowl also receives an average of 300 inches of snow a year. Getting to Montana Snowbowl couldn’t be simpler. 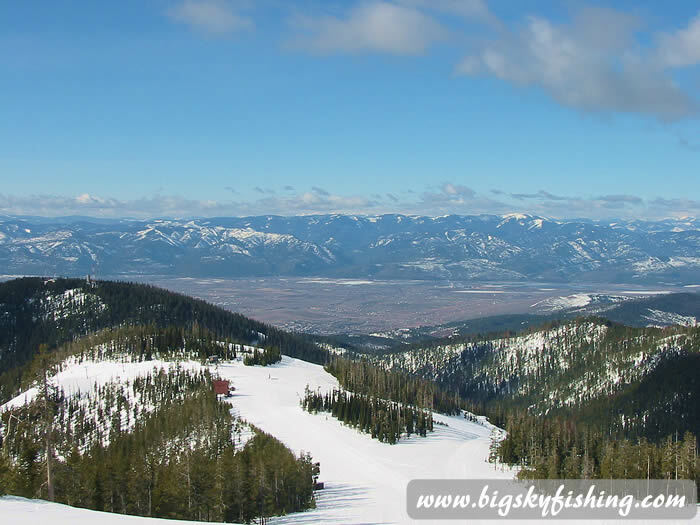 The ski area is just an 8 mile drive from downtown Missoula. The road to Montana Snowbowl is, by ski road standards, not bad. The first couple of miles are paved. The remaining 5 miles are along a gravel road. However, for much of this roads length, the road is pretty flat, although a bit twisty. And for a gravel mountain road, it is reasonably wide and well plowed. While common sense needs to be exercised in driving up the road during snowy or slippery conditions, the drive is not a death defying experience by any means. The base area at Montana Snowbowl is typical of what is found at most other smaller, Montana ski areas. There is a nice and functional base lodge, with a few smaller buildings housing the ski patrol and ski rental facilities. And, somewhat surprisingly, Montana Snowbowl also has some limited slope-side lodging available. The Gelandesprung Lodge is a European style lodge with shared and private baths; hot tub; and kitchen facilities. It is also, considering the cost of slope side accommodations at other ski areas, affordable. Montana Snowbowl is essentially one big bowl, built off a peak named Big Sky Mountain, which has a summit elevation of 7560 feet. When looking up to the top of the mountain from the base area, the bowl looks rather intimidating. And for intermediate and beginner skiers, truthfully, it is. Virtually all of the skiing terrain that begins at the summit and heads back to the base area through the giant bowl is rated for expert skiers. In general, the terrain in the bowl is steep, has lots of bumps (or powder after a good snowstorm) and has extensive glades. The ski area itself only has two chairlifts, both double-chairs. The first chairlift, the Grizzly Chair, runs from the base area to the ridge beneath the summit. To reach to the summit, it is necessary to ski down a fairly flat cat-trail that leads to the backside of the bowl. From here, the LaValle Creek double leads to the summit. From the summit, the visitors is rewarded with great views of the Bitterroot Valley. Truthfully, Montana Snowbowl is not the greatest mountain for the beginner skier. While Montana Snowbowl does have some beginner terrain, along with a true dedicated beginner area served by a surface lift, beginner terrain at Snowbowl is limited. There are no beginner runs from the summit, and only one semi-beginner run from the top of the Grizzly Chair. In short, Montana Snowbowl may not be the best place to visit for new skiers or snowboarders. 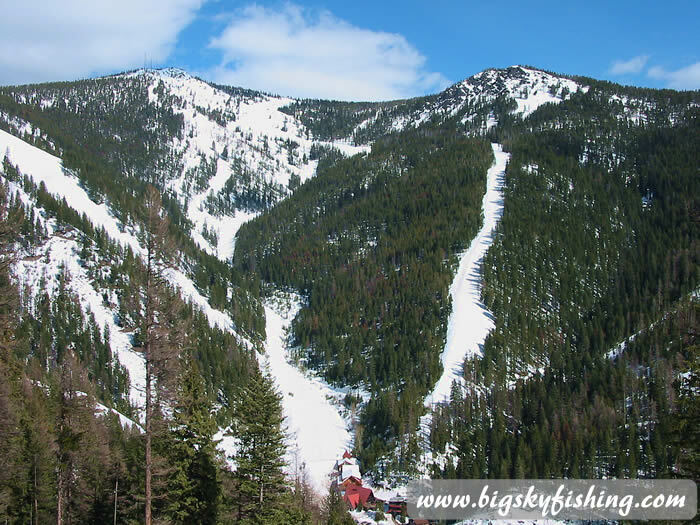 Instead, consider visiting Discovery Ski Area which has a much nicer and larger network of beginner ski runs, and is less than 90 minutes from Missoula. Blacktail Mountain, which is about 2 hours away, is another option for beginners. Montana Snowbowl has a fair network of intermediate ski runs that are groomed. Virtually all of the intermediate ski trails are accessed off the summit, on the back side of the bowl which is serviced by the LaValle Creek chairlift. All of the ski trails on the backside of the bowl are of the intermediate level, are wide and well-groomed. Also note that the LaValle chairlift does not access the base area. It is, for lack of a better word, its’ own little region on the backside of the huge bowl that the base area of Snowbowl itself is located in. Only two intermediate ski runs make their way down from the summit to the base through the bowl. These two ski trails are called Paradise and Centennial/Longhorn. Both of these intermediate ski trails are challenging. Unfortunately, to reach them requires a long traverse along a fairly flat cat-trail. A handful of other intermediate ski trials are found along the ridge above the base area, too, although these trails go in and out of beginner terrain (will be a blue run for a bit, then convert over to a green run, then back to blue, etc…). While Montana Snowbowl has decent intermediate skiing, truthfully, the ski area truly caters to the expert skier. The bulk of the terrain at Montana Snowbowl is expert rated (and virtually all of the “off- trail” areas are also at the expert level). And it gets even better if skiers seek out tree skiing, as more than half of the terrain at Snowbowl is gladed. Moreover, it isn’t even necessary to go to the summit to reach the expert level trails. There’s some superb expert skiing right off the top of the lower chairlift (the Grizzly Chair). Probably the most popular expert terrain, especially on a good snow day, is skiing straight into the bowl from the summit. Numerous trails and options exist to ski through the bowl. Some of the terrain is heavily wooded, other terrain is lightly wooded and a few spots are pretty much wide open. All of the terrain, though, is steep. Popular routes include West Bowls (the steepest), West Ridge and East Bowls. East Bowls is also a good trail for bump skiing. 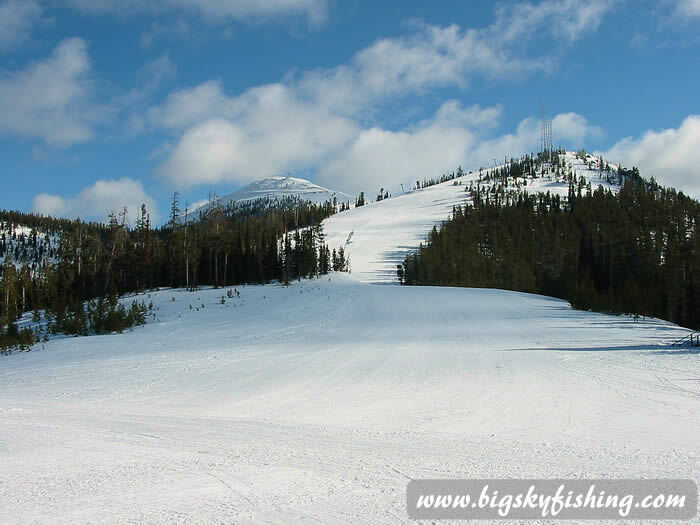 More expert ski terrain is located right off the Grizzly chair on the lower mountain. The Grizzly trail is a fun trail that offers a ton of options, from steep open terrain in the bumps and powder to skiing through the trees. An additional bonus of this trail is that skiers can scout out the trail while riding the Grizzly Lift, since the lift basically follows the trail. Another great expert run on the lower mountain, Spartan Headwall, makes its way down the steep ridge that towers above the base area. This trail can be fun for intermediate skiers too, since it is generally groomed and the snow making keeps the trail well covered in snow. Overall, Montana Snowbowl is a great ski area that is especially well suited for expert skiers and for those who enjoy glade skiing. The ski areas location just a short hop from Missoula is also very convenient, too. Visitors that happen to be in Missoula with skis in tow should make a point of taking the time to visit Montana Snowbowl. Terrain : 20% Beginner, 40% intermediate, 40% advanced/expert.